Hi folks! I am a thirty nine year old beginner at the violin. I should be going to pick up my beginner instrument here on monday or tuesday. 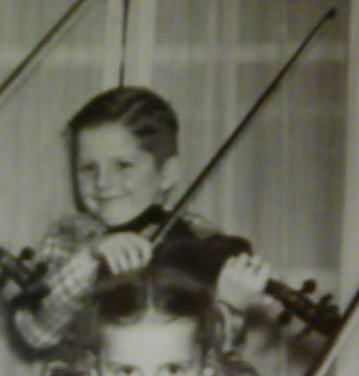 I have loved music for a long time and as a child I was encouraged to play the guitar, which I still do. I play flamenco and delta slide guitar more often than any other styles and I enjoy them very much. I realized that what I enjoy about the two styles is the complete immersion you have to have in order to play them. A bit of background as to what I have done in life. I was a sailor in the US Navy from 2001-2005 aboard the USS Leyte Gulf. After that I went to work for GE building Wind Turbines (my usual workday was 300 feet up in a wind turbine) for six years. Now I am trying to finish my degree here in Houston as a technical draftsman. I look forward to the challenge of the violin, and I love many different styles of music composed for it. Everything from traditional irish to Beethoven and some things that don't fall in-between those two! The idea of one day playing a fierce irish jig or Beethoven's Ode to Joy fills me with anticipation of hard work and ultimately that rewarding feeling that only comes from having learned to play one sweet jam. It's nice to meet such a lovely group of people on the internet by the way! I enjoy it. So nice to have you join us here, and we're like a family. Good luck with your adventure, and keep us posted on your progress. Nice background, very interesting. As Ratvn said, we are like family here so we wish you much luck with your endeavors. Your comment brought back a memory of a video I saw a few years back. Good grief, it wouldn't be me on the towers you tackled. Welcome, Joe, ex-lurker !!!! Happy to have you aboard - share your progress with us - ask questions (and there's no such thing as a 'stupid' question) - folks of all levels here to help you on your journey ! It definitely worried my mother quite a bit to have me 300 feet in the air, the video you posted was pretty accurate if a free climb was called for. I've free climbed many, many different structures in the wind and cell tower industry, some as high as 1500 feet. It's funny, but I do miss it because of the permanent adrenaline high sometimes. So nice to have you here. Looking forward to hearing about your violin and your endeavors. I think you will be able to work on Ode to Joy soon. It can be played all on one string if you can play fourth finger, or it is easy enough to pop over to the A string. (that is one of the songs i was invited to play at an orchestra gathering coming up). And there are plenty of nice Irish jigs to learn.. woo hoo. It is about learning and having fun. Welcome, Joe! Glad you're not lurking anymore. Congrats on getting your first violin and embarking on your learning journey. Keep us posted! Welcome Joe! I would love to hear you play 'Ode to joy'. Welcome and good luck in your drive to play that hard charging Irish reel! i am also very interested in that style of music, but it may be some time before I can get there. Don't be shy to ask questions - I have gotten a lot of help and corrective criticism, which I am trying to implement now. I second your impression that the community here is a good one. Everyone seems really eager to help each other out. What's really kind of funny is my first violin was supposed to be here last week, but has auto-magically failed to appear! It's really enough to make me pretty darn frustrated. However, I keep practicing reading music (just learned the other day) and try not to call and irritate the violin people any further. But if they don't deliver this week, I think I'm just going to find an alternative fiddle to fiddle around with. I also cannot wait to play me some Ode to Joy and maybe a bit of Whiskey in the Jar or just practice an A minor scale! I have channeled some of this frustration into my flamenco playing and playing fast and loud does give some relief. Oh heck - it's the waiting that hurts so much, ain't it just ! A new instrument - it is a "need" not a "want" - I get that totally ! May it arrive soon ! I sincerely hope we aren't talking about our shop by your description of the delay it is taking. We usually ship our fiddles the same day or day after unless we let you know about reasons for delay. I enjoyed your introduction and am happy that you are no longer lurking. Sorry to hear about it. They probably have a hard time and don't sell that many instruments. It's not easy to be a brick and mortar shop competing with online shops that have far less expenses and more sales. Unfortunately it's not optimal in your position. Is it an instrument that you tested? I do think it's a good idea to support local shops to avoid loosing them. However, they risk loosing business with that kind of treatment. Welcome to the forums Joe! I am new here too and was also a lurker for a while. I hope your violin has turned up by now and that you are able to finally play and practice with it! Entering the third week of no violin. I'm very disappointed about this and frankly, I'd have written it off and gotten another one but now I'm curious as to how long this is actually going to take. In the meantime I'm just reading music and listening to videos. Please have some music (lessons, scales, simple sheet music etc.,) printed while you wait for the violin. You can even have shadow practicing. I hope the waiting will be over soon. Good luck.